A mermaid from Tritonis who fell in love with Clark Kent while attending Metropolis University. Lori Lemaris hails from the Atlantean city of Tritonis, a sect of undersea humans whom adapted to have fish like tails. They are the source for all myths about mermaids. When Lori was injured she was healed by a young physician Ronal, who used magic to heal her . Eventually, they married, but his dabbling with dark magic eventually drove him mad. Ronal attacked the other merfolk with his form-altering power, including Lori. She sought out assistance from Superman, who ultimately stopped Ronal and his mutated sea creatures. When Superman destroyed Ronal's staff, the wizard was apparently turned to stone. 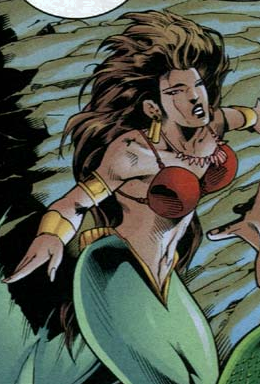 Atlantean Physiology: Lori can develop human legs on land and the lower half of a fish when in water. She can swim at incredible speeds and can withstand the pressure of the ocean at great depths. Adapted for breathing underwater and resisting deep-sea-level pressure. Self-Sustenance: Part of her Atlantean heritage; she can breathe underwater and on land for extended periods. She can also resist deep sea pressure and swimming speeds at great length.